Small plants grow to a maximum of 30 cm, and flower from July to October. Their small cordate (heart-shaped, pointed at tip) leaves are basal and have long petioles. Each flowering stem has one heart shaped leaf, the round lobes of which wrap around the stem, and one flower. The 2cm wide flowers have five small green sepals, and five white petals with clear veins. The petals are slightly notched at their tips. The stamens of the flower are a good identifying feature. There are 5 stamens and in between each is a fan shaped sterile stamen. The branches of these fans end in a yellow/green glands. The four-lobed stigma emerges from the top of the fused carpels which form a large superior pink-tinged ovary. There are no other closely related species in Ireland. Grass of Parnassus is not easily confused with other species in damp grassland. Its key identifying feature is the non-fertile fan shaped stigmas. Check the basal heart-shaped leaves and single sessile stem leaf to separate Grass of Parnassus from other white flowers. Grass of Parnassus grows in damp grassland and habitats such as dune-slacks, fens, lake shores and mountain cliffs. In parts of the west and midlands of Ireland Grass of Parnassus is locally common, but it is much less so in other parts of the country, with apparent losses in the south midlands. Habitats are under threat of being lost due to land abandonment, agricultural improvement and drainage. 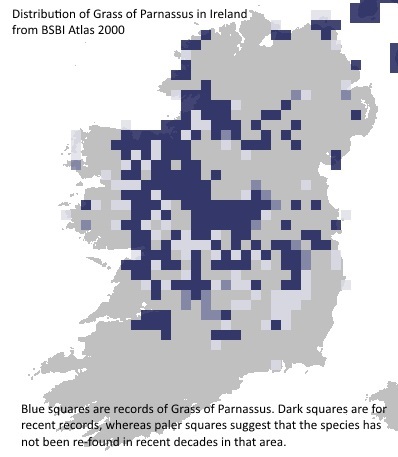 If you have seen Grass of Parnassus or any of the species in the Irish Species Project, please fill out a recording form. It can be downloaded here, and you can also download the guidance document for detailed instructions (both also available at http://www.bsbi.org.uk/ireland.html).